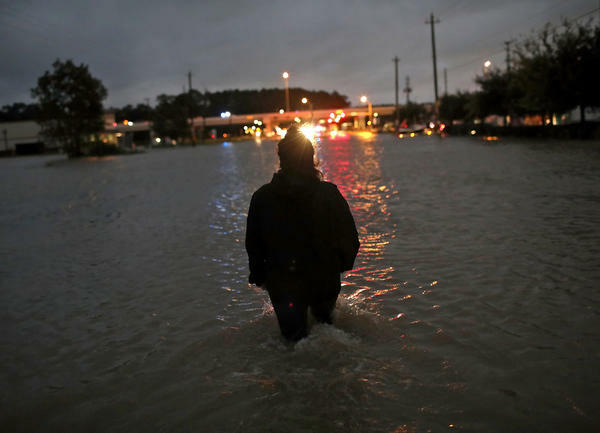 A Houston resident walks through waist-deep water while evacuating her home after severe flooding following Hurricane Harvey in north Houston. She and her team had been studying the health of young parents attending community college in New Orleans starting in 2003. After Katrina hit in 2005, they found themselves with a unique opportunity: they had health data from before and after the natural disaster. The researchers were able to measure Katrina's mental health impacts in a project called the Resilience in Survivors of Katrina Project (RISK). Most people fare well in the long term, they found, but some are still struggling years later. Ailsa Chang, guest host of All Things Considered, spoke with Rhodes about the project and what lesson those people's experiences may hold for people dealing with Hurricane Harvey and Hurricane Irma. Excerpts of the interview follow, edited for length and clarity. How did going through a major disaster like Katrina affect people's mental health long term? Well, here's some good news. About 60 percent — more than 60 percent if you look at their mental health over time — have returned to where they were prior to the storm. We often hear that there are these long-term consequences. There are, for about 20 percent, we see actually their anxiety and depression went up, and it stayed up. For some there was actually an improvement, they're actually doing better than before. Yes, so there's two ways in which they are doing better. Their psychological functioning, about 3 to 5 percent were doing better on indices of anxiety and depression. There's also this other interesting unexpected finding. That's something called post traumatic growth; this is really the flip side of post-traumatic stress. They often go hand in hand. Stress can often precipitate changes in our perspective about life. We begin to appreciate life more and feel a personal sense of strength of having endured the trauma. We see new possibilities. We begin to value relationships over things. And really have a spiritual awakening that psychologists have begun to appreciate comes often hand in hand with post-traumatic stress. In aftermath of Katrina, some people in the study got access to mental health care for the first time in their lives — that turned out to be crucial for them. Since then, have you see a greater push to get mental health services out to people faster after a natural disaster? Yes, I've seen a much broader, more integrated mental health response to the survivors of Harvey and Irma in ways that I think are going to have long term consequences. One of the things that we know about exposure to natural disasters is that there's kind of this critical period where if you're not exposed to additional stressors and you can begin to process and make sense of what happened, you can begin to heal. It's almost like a concussion — if you are continuously hit with new stressors after the initial stressor, it makes it much harder to heal. I think that the responses in Houston and Florida have been much quicker and have really tried to minimize additional stressors that will have long-term implications for survivors' mental health. You say pets were a surprisingly big factor. Why is that? One thing that was different from Katrina is that there was a lot less pet loss. Shelters were much more open to including pets, and people weren't put in this forced choice between staying with their pets versus evacuating. Because of that, there was less exposure and less trauma. Five years out of Hurricane Katrina, we saw that the loss of a pet was one of the three biggest predictors of depression and anxiety. Because we didn't have as much separation between pets and their owners, we probably will be seeing less of that particular stress. All Things Considered producer Selena Simmons-Duffin and senior producer Andrea Hsu contributed to this report. Greta Jochem is an intern on NPR's Science Desk. Cleanup is well underway in Florida and Texas and other places hard hit by the recent hurricanes. But long after the debris is cleared, there will still be mental health hurdles for the survivors, especially for those who are still out of their homes. Psychologist Jean Rhodes of the University of Massachusetts Boston has spent the last decade studying what happens to people long after a natural disaster. In her case, she focused on Hurricane Katrina. And what's unusual about her study is that she also has data from before Katrina hit. Professor Rhodes joins us now. Welcome. CHANG: So in 2004, you and your colleagues launched this study of something actually quite different from what we're going to be talking about in a minute. Your study was originally about community college, graduation rates, right? And as part of this, you surveyed about a thousand people in New Orleans. RHODES: That's correct. We were down there studying why some young women graduated and others didn't. So we were looking at single mothers, most of them mostly African-American, mostly living in the Lower Ninth Ward and other areas that were affected by Hurricane Katrina. And so we were looking at their health and their demographic characteristics and their psychological profiles and all sorts of things. And we were out in the field collecting a wave of data when Hurricane Katrina hit. CHANG: And the community colleges in New Orleans shut down. So I understand you turned your work into a study of the long-term mental health impacts of the storm. Why did you choose to do that? RHODES: Well, at first we were just really despairing that our entire study was basically washed to sea. And then the investigator with whom I've worked most closely on this, Mary Waters, called me. And she said, you know, I think we have an opportunity here because we have so much data on the young women before the storm hit, and that way we can control for how they were functioning prior to the disaster. And so we decided to look not just at mental health but health outcomes, you know, basically immediately. And then we got another grant to study it five years after the disaster. And recently we have another grant. We're out in the field, and we're looking at survivors 10 to 15 years after a disaster. CHANG: And I understand that one of the long-term consequences that you discovered through your study was this upside that comes with some of the trauma people suffered. Can you talk about that? RHODES: That's correct. There's something called post-traumatic growth. CHANG: Post-Traumatic growth - I've heard of post-traumatic stress. RHODES: ...There are merits to it. There's this idea that sometimes when we are brought to the brink of things, it strengthens us. We begin to appreciate life more and feel a sense of personal strength for having endured the trauma. We see new possibilities. We begin to value relationships over things and really have a spiritual awakening. Those kinds of existential things we see in about 75 percent of our sample. CHANG: What a lovely consequence of such a terrible storm. You know, in the aftermath of Katrina, some of the people in your study got access to mental health care for the first time in their lives, and that turned out to be crucial for them. And since then, have you seen that there's been a greater push to get mental health services out to people faster after a natural disaster? RHODES: Yes. I've seen a much broader, more integrated mental health response to the survivors of Harvey and Irma in ways that I think are going to have long-term consequences. RHODES: One of the things we know about exposure to natural disasters is that there's this kind of critical period where if you're not exposed to additional stressors and you can begin to process and make sense of what happened, you can begin to heal. It's almost like a concussion. If you are continuously hit with new stressors after the initial stressor, it makes it much harder to heal. And with Katrina, we saw really an escalation of stressors. You know, we saw the scenes of desperation on rooftops and the convention center and all of that. RHODES: And I think that the responses in Houston and in Florida have been much quicker and have really tried to minimize additional stressors in ways that will have long-term implications for the survivors' mental health. CHANG: Do you have a quick example of what you mean by that? RHODES: Yeah. One thing that impressed me was that there was much less pet loss this time around. RHODES: Shelters were much more open to including pets, and people weren't put in this forced choice between staying with their pets versus evacuating. And because of that, there was less exposure and less trauma. And because we didn't have as much separation between pets and their owners, we probably will be seeing much less of that particular stress. CHANG: That's psychologist Jean Rhodes of the University of Massachusetts Boston. Her study is called the RISK Project, which stands for Resilience in Survivors of Katrina. Thanks very much for speaking with us. RHODES: You're welcome. Transcript provided by NPR, Copyright NPR.